In a manufacturing environment, the manufacturer combines raw materials items into finished-goods items. This means — and this is the challenging part — that the manufacturing process reduces the inventory count and value for some items (the raw materials or the components) and at the same time increases the count and value of the other, finished-goods items. In a manufacturing environment, the rules say that you don’t just count the value of items in the finished-goods-item inventory values. You also count the cost of labor and factory overhead used in manufacturing the items. QuickBooks solves the first problem related to manufacturing inventory, but it doesn’t solve or address the second problem. Fortunately, as long as you’re a small manufacturer, you probably don’t need to worry too much about the second problem. You should ask your CPA about this. But don’t worry — Congress and the Internal Revenue Service have provided a bunch of loopholes that make the accounting easier for the small guys. 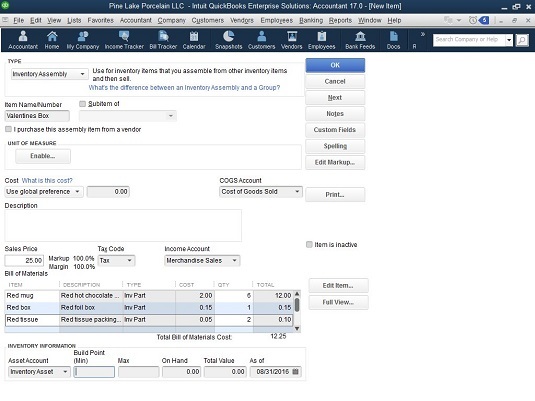 If you’re using QuickBooks Pro or some earlier versions of QuickBooks Premier, you don’t have the ability to account for the manufacture of inventory in QuickBooks. The best that you can do is group items to combine into individual items in a customer’s invoice. This approach sounds sloppy, but it isn’t quite as bad as you may think at first blush. You can choose to show only the group item in a customer invoice. This means — getting back to the example of the florist selling red roses and vases — that the florist can “manufacture” a crystal vase of a dozen red roses and then show the manufactured item as a group item in the customer’s invoice. The one thing that’s problematic about the “just use a group item” approach is that it doesn’t give you a way to track the finished goods’ inventory values. To account for the manufacture of inventory in QuickBooks Premier or QuickBooks Enterprise Solutions, you add inventory assembly items to the Item list for those items that you manufacture. You also record the manufacture of items as you … well, manufacture them. Suppose that Pine Lake Porcelain mostly just buys and resells coffee mugs and other porcelain doodads. But also suppose that once a year, Pine Lake Porcelain assembles a collection of red coffee mugs into a boxed St. Valentine’s Day gift set. In this case, QuickBooks can record the assembly of a boxed gift set that combines, for example, four red coffee mugs, a cardboard box, and some tissue-paper wrapping. QuickBooks displays the Item List window. Click the Item button in the Item List window, and choose New from the drop-down list. QuickBooks displays the New Item window. Choose the Inventory Assembly item from the Type drop-down list. 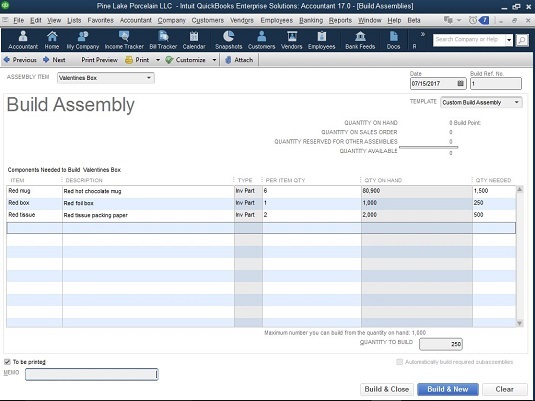 QuickBooks displays the Inventory Assembly version of the New Item window. Specify the account to use for tracking this item’s cost when you sell it. QuickBooks suggests the Cost of Goods Sold account. If you’ve created other accounts for your COGS, however, choose the other appropriate account. Enter the amount that you charge for the item in the Sales Price box. Indicate whether the manufactured item is subject to sales tax by using the Tax Code drop-down list. Use the Income Account drop-down list to specify the account that you want QuickBooks to use for tracking the income from the sale of the item. Identify the components that go into the finished item. Use the Bill of Materials list to identify the individual component items and the quantities needed to make the inventory assembly. Each component item goes on a separate line in the list. Not to be too redundant, but do note that you identify both the component item and the number of component items needed. Specify the other current asset account that you want QuickBooks to use for tracking this inventory item’s value. Use the Build Point boxes to specify the lowest inventory quantity of this item that can remain before you manufacture more. When the inventory level drops to this quantity, QuickBooks adds a reminder to the Reminders list, notifying you that you need to make more of the item. Ignore the On Hand and the Total Value boxes. See that On Hand box? Leave it set to zero. To enter a number now is to record an uncategorized transaction, and you don’t want to do that. Go ahead and leave the Total Value field set to zero, too. Leave the As Of box empty, or enter the current date. The Inventory Assembly version of the New Item window. The Build Assemblies version of the New Item window. In the top-right corner of the window, QuickBooks shows the quantity of the assembly that you have on hand and the number of customers who have placed orders. That’s pretty useful information to have, so remember that it’s there. A table in the Build Assemblies window shows you what goes into your product. Not that you care, but this is a bill of materials. At the bottom of the bill of materials list, QuickBooks shows you the maximum number of assemblies that you can make, given your current inventory holdings. When you build an item, QuickBooks adjusts the inventory item counts. If you make boxed gift sets, each with four red mugs and two wrapping tissues, QuickBooks reduces the item counts of red mugs and wrapping tissues, and increases the item counts of the boxed gift sets when you record building the assembly. Some of the components used in an assembly may not be inventory items. You can use noninventory parts in an assembly. QuickBooks Enterprise Solutions lets you deal with the record-keeping challenge of storing inventory in multiple locations. To turn on this capability, called Advanced Inventory Tracking, choose the Edit → Preferences command, click Items and Inventory, click the Company Preferences tab, and then click the Advanced Inventory Settings button. If you’re using the Enterprise Solutions version of QuickBooks, QuickBooks displays dialog boxes that allow you to build a list of inventory sites, and also adds fields to appropriate windows and dialog boxes so you can track inventory items by site. If you’re not using the Enterprise Solutions version of QuickBooks, QuickBooks displays information about how you can upgrade to Enterprise Solutions.